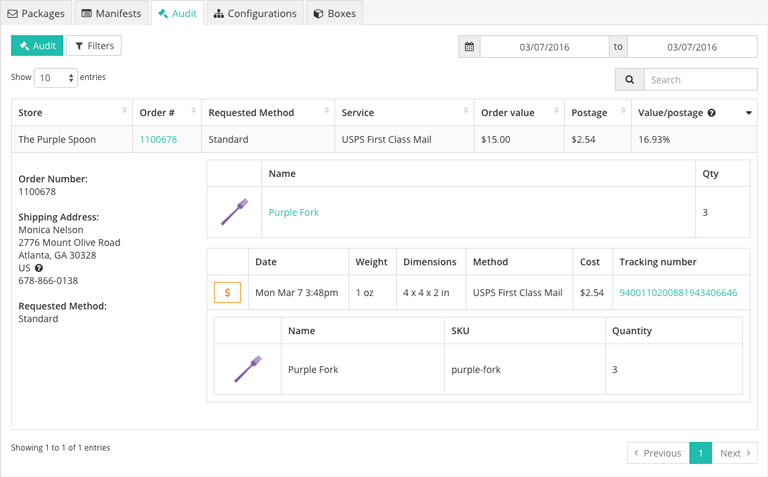 The Audit tab is where you can audit your shipments and the postage paid on each of them. From here, you can check the details and paid postage for recent shipments to determine if you paid the appropriate rate for each order. Audit: This will check every shipment in the audit table to see if postage costs could have been saved by selecting a less expensive shipping method. Shipments highlighted in green are confirmed to have been shipped in the most cost-effective way, while shipments highlighted in red may have been shipped through a costlier method than needed. Filters: You can filter what is shown in the audit table by sales channel. Search: This allows you to search for shipments by their order number, customer name, and more. Service: The shipping method that was used to ship out the package. Order value: The total value of the items in the order. This may not reflect the amount paid by the customer due to other factors, such as sales tax and promotional discounts. Value/postage: The portion of postage paid in relation to the total order value.